Indulge and moisturize your skin with this luxurious After Sun product line. These products contain the most fragrant rich, creamy formulas for your beautiful skin. Infused with nourishing ingredients such as Aloe Vera and Cocoa, Shea and Mango butters, these moisturizers are great for everyday use! Great scent and works on contact if you have a burn or just for cooling off after a day of hot sun. I love it! Great Scent! Great moisturizer. BONUS: Clears up eczema too!! It smells great, fast absorption, and great moisturizer. I like this product a lot. 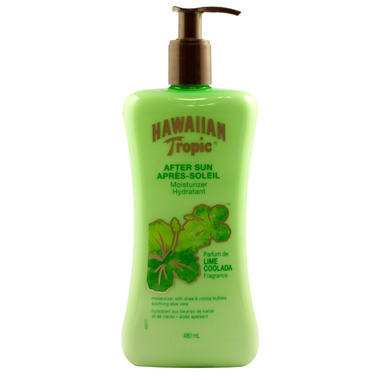 I bought this product to replace "Forever Tan Aftersun" also by Hawaiian Tropic. However I find there is no comparison: the original product is excellent, wheras the "after sun" product is nowhere as soothing, and non-greasy. The original product is also half the price. Too bad. It seems winning formulas are always tossed. Like the product but does not soak into the skin as quickly as I had hoped. I just want to put out there - for anyone with ECZEMA, this is a great product. I bought it after I had a sunburn one time, for the Aloe in it. And it actually helped my eczema clear up as well, and does not sting. It's not in place of a prescription or eczema cream or ointment - but it certainly helps! I use this as my everyday body lotion - feels & smells amazing! Good value too. The best after sun and all year round body lotion. Smells like a vacation in a bottle!